Kaki King is excited to introduce Treya Lam, the first artist signing to Kaki's own label,Short Stuff Records. A classically trained multi-instrumentalist based in Brooklyn, Treya’s debut album, Good News, was produced by Kaki (who also plays multiple instruments throughout the album), and recorded with an array of talented female musicians, most notably Catherine Popper (Ryan Adams, Jack White, Norah Jones) on upright bass, and mixer Erin Tonkon (David Bowie, Esperanza Spalding). Mastered by Sarah Register,Good News is an instant classic, full of the kind of songwriting and raw talent that has never gone out of style, as well as a message of love, longing. Because as Treya says, "It's never too late to have a happy childhood." Last summer Kaki's 3-year-old daughter was suddenly diagnosed with a life-threatening illness, turning her family's life upside down. Clinical records alone hardly capture the full impact the illness of a child has on a family. Can a softer and more empathic approach to what we so coldly call "data" help us make sense of what's happening in our lives? 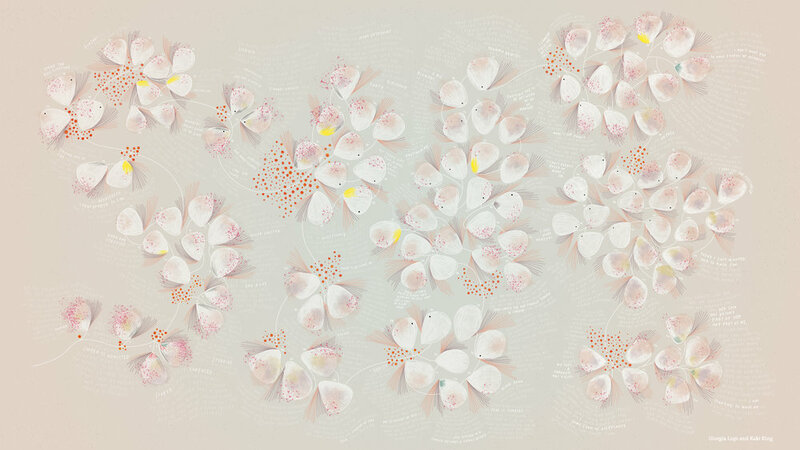 Can data visualization help us emotionally as well as cognitively? Kaki and her friend Giorgia Lupi, a data designer and visual artist, tap into what Lupi calls “Data Humanism” to find out. One day last summer, Kaki noticed her three-year-old daughter Cooper was suddenly covered with bruises. Kaki and her wife were confused and slightly worried, unable to figure out where the bruises came from. But the alarm bells really went off when, in the middle of the night, Cooper awoke with blood in her mouth. 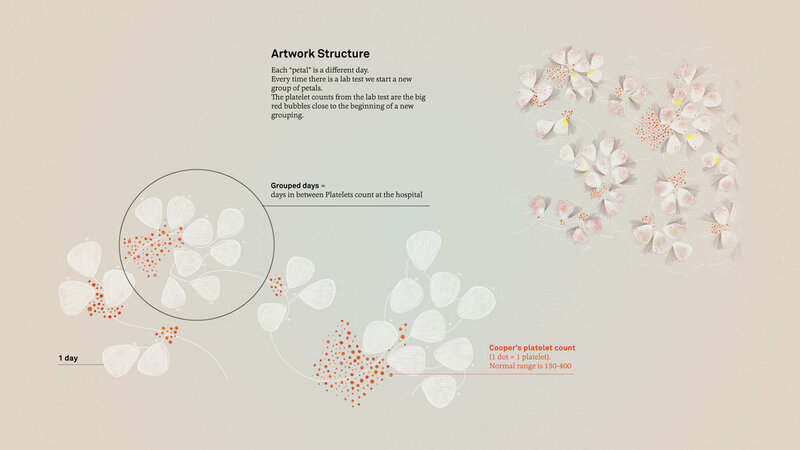 When her friend and fellow artist Giorgia Lupi, with whom she had collaborated on a recent design project for Hennessey, learned what the family was going through, she proposed a creative exercise using music, art and data – both medical and personal – to help Kaki bring a sense of clarity and calm to what was happening. The result is the beautifully cathartic “Bruises”. 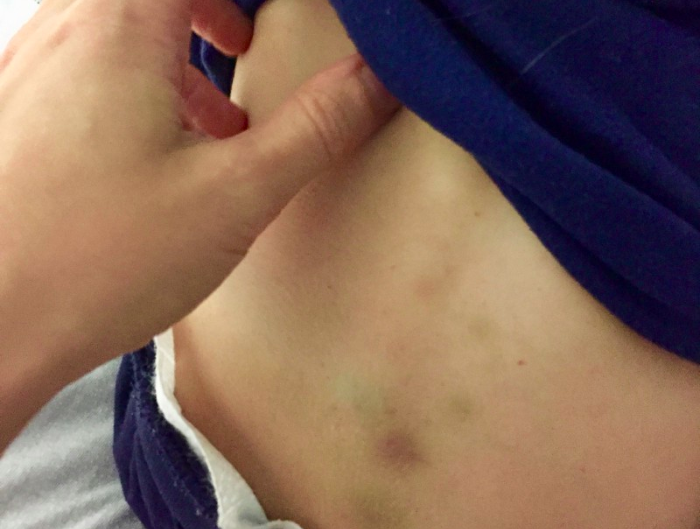 For a deeper and more detailed exploration of this project, check out Giorgia's story, "Bruises: The Data We Don't See" on her Medium blog (here). Kaki is releasing a new album this fall, and once again she's created something completely unexpected. The album, recorded live at the Red Room at Cafe 939 in Boston in April of 2017, features King performing new arrangements of her solo guitar compositions, reimagined with the addition of strings and woodwinds. King, Tom Hagerman of Devotchka, and Berklee students Takuma Matsui and Shereen Cheong wrote the arrangements specifically for the recording.The Porta Girevole Chamber Orchestra is a 12-piece ensemble composed of Berklee students and faculty, conducted by student Gabriela Sofia Gomez Estevez. Kaki King Live at Berklee will be released on September 22, and is available for preorder here. BirnCORE, the Berklee Internet Radio Network's (BIRN) record label, gives students at the college the opportunity to learn the ins and outs of operating an independent record label. Kaki King Live at Berklee is the label's first release to feature Berklee students and faculty collaborating with a visiting artist. King visited campus several times last spring to rehearse with the ensemble, culminating with the live performance and recording. Provocative and moving, surprising and beautiful, “The Neck Is A Bridge To The Body” is Kaki King at her visionary best: deconstructing and redefining the role of solo instrumental artist though virtuoso technique, insatiable imagination, and boundless humanity. King's groundbreaking new multi-media performance uses projection mapping to present the guitar as an ontological tabula rasa in a creation myth unlike any other. The Neck Is A Bridge To The Body debuted at Brooklyn’s acclaimed BRIC Theater in New York City in 2014, and is touring extensively. An album recording of the show is available on iTunes or Bandcamp. Friends and Lovers! Kaki's new video "Tunnel" just premiered with Stereogum today. The song is on the new album 'Everybody Glows: B-Sides & Rarities,' out now on Bandcamp and iTunes - digital only. Everybody Glows: B-sides & Rarities, out November 4, features a collection of outtakes, demos, covers, live versions and never before heard recordings culled from scratched demo CDs, long forgotten hard drives, and the fuzzier corners of her memory. The collection reveals the evolution of her songwriting while offering a glimpse of a young guitarist doing daring things on her instrument before she grasped the significance of any of it. The album comes with a track-by-track explanation of each song, along with liner notes written by her biggest supporter and fan: her father. In other news, Kaki is preparing an entirely new show, The Neck is a Bridge to the Body, for 2015, featuring high-concept projection mapping in collaboration with Glowing Pictures. A recording of The Neck is a Bridge to the Body will also be released in 2015 in conjunction with extensive international touring. A preview of the new show will be presented on the West Coast in Decembe (see tour dates).